Soccer watch party in Kansas City. I admit watching some of last Sunday’s World Cup game between “USA, USA, USA” and Portugal. It was more of a curiosity than me being a fan. You now, it’s like when you slow down to see the wreck on the other side of the interstate. You don’t want to look, but you do. In the interest of disclosure, I was the goalie for my high school soccer team for two or three seasons. I knew nothing of the game other than to stop the ball from rolling into the goal. My high school team was comprised of immigrants from the then Yugoslavia. The guys who played in front of me, who spoke little English, were fond of yelling, “KEEK BULL, KEEK BULL,” if the ball happened to roll down to me. That was my cue to punt the ball to the middle of the field. The ball rarely came within 20 yards of me. It was an OK sport. Playing on the soccer team didn’t get you a date with the hot cheerleader, but it got you a letter and at least you stayed active. If you’ve listened to sports talk radio the last month you can’t get away from hosts, who know little about the game, continuously telling you: (1) it’s a great sport and you should watch, (2) the world likes it, so you should too, (3) it’s the sport of the future. No insight. No understanding of the game, nothing other than a continuous indoctrination being provided to us by ESPN and to a lesser extent Fox Sports Radio. Heck ESPN has to import play by play announcers from England! Something struck me when seeing video of the watch parties in cities across America, the people in the crowds are 30 and below. Bars are filled with young people engaged, watching and cheering. In fact Sunday night’s game, which started at 6pm ET, had 24.72 million people watch. 18.22 million watched on ESPN. 6.5 million more watched on Univision for the Spanish language play by play. Compare that to a crowd watching a baseball game. I went to a Cincinnati Reds’ Sunday afternoon game a few weeks ago. The crowd was pre-dominantly 40 plus. Few were paying attention or engaged in the game. The children, who were there for family time with their grandparents, were asking “if it was time to go” in the 3rd inning. The 2013 World Series between the Boston Red Sox and St. Louis Cardinals averaged just 14.9 million viewers. Arguably, each team is a legacy MLB franchise with a huge fan base. The 2014 NBA Finals between the Miami Heat and the San Antonio Spurs drew 15.5 million viewers on average. And that’s with Lebron James, the NBA’s biggest star. The 2014 NHL Finals between the Los Angeles Kings and New York Rangers, America’s two largest cities, had about 5 million people watching on average. Is soccer the sports of the future? Sure looks that way. The 30 and under crowd you see at watch parties and filling bars to watch the World Cup is the generation that grew up playing soccer in parks across America. 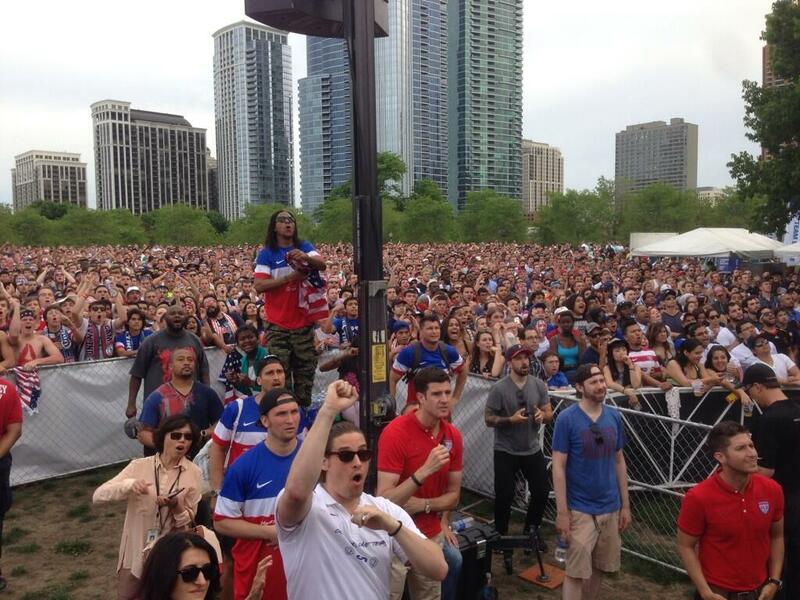 The growing Hispanic population of America is a people who love soccer. It’s their game of choice. And soccer will finally succeed in America because it has to. FIFA, the governing league of the World Cup, needs the United States of America to fund the World Cup, just as the IOC needs the USA to fund the Olympics. Without America’s advertisers, consumers and wealth neither the World Cup nor the Olympic Games exist. Don’t believe me? Here are some of the other countries playing in the World Cup. Brazil. Host nation. To be expected. Rumors are they’re going to screw up the Olympics. Croatia. My high school team was from this area. Country changes name every 20 years or so. Netherlands. Nice people. Cute women. Costa Rica. Only reason it’s famous is Jurassic Park took place there. Cote D’ivoire. Huh? Where is this place? I can’t even pronounce it. 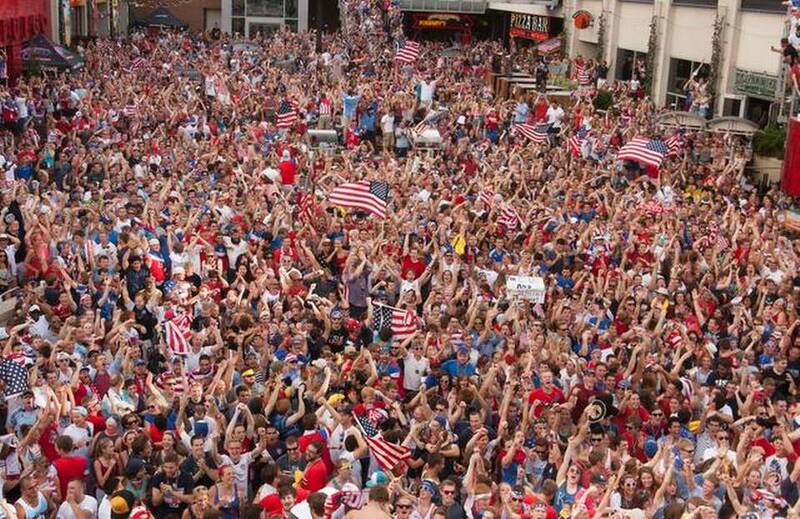 The World Cup needs you and it needs America. You WILL watch soccer and you WILL like it. Yes, Parks. You vill watch soccer and you vill love it!